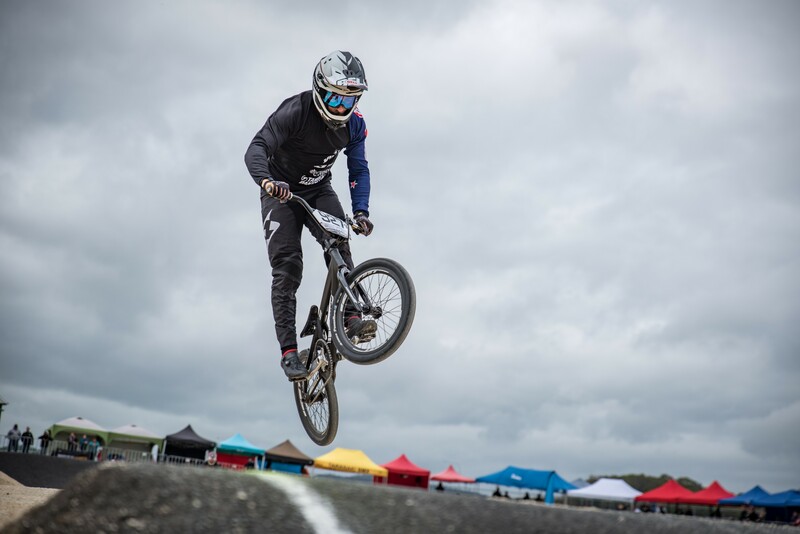 Waikato rider Cody Hobbs hopes his victory in the elite men’s final of the FIRST BMX Championship Nationals will spark his goal of competing in the 2020 Tokyo Olympics. A photo-finish was required to confirm Hobbs as the men’s winner by the narrowest of margins from defending champion and Rio Olympian Trent Jones and 2016 junior elite world champion Maynard Peel in the elite men’s final at the Christchurch City track. Officials had worked overtime to prepare the track after wet weather ruled out racing until late in the afternoon, even calling in a helicopter to help with the drying process. 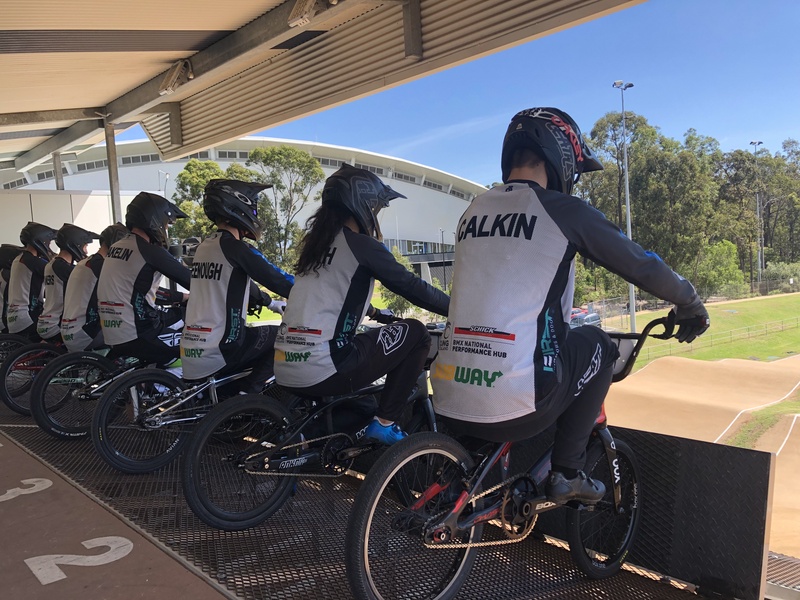 Racing got underway after 4pm, with the elite national championships incorporated into the South Island BMX Championships. Hobbs’ Te Awamutu clubmate Rebecca Petch, runner-up in the behind Sarah Walker for the last two years, claimed the women’s elite honours. 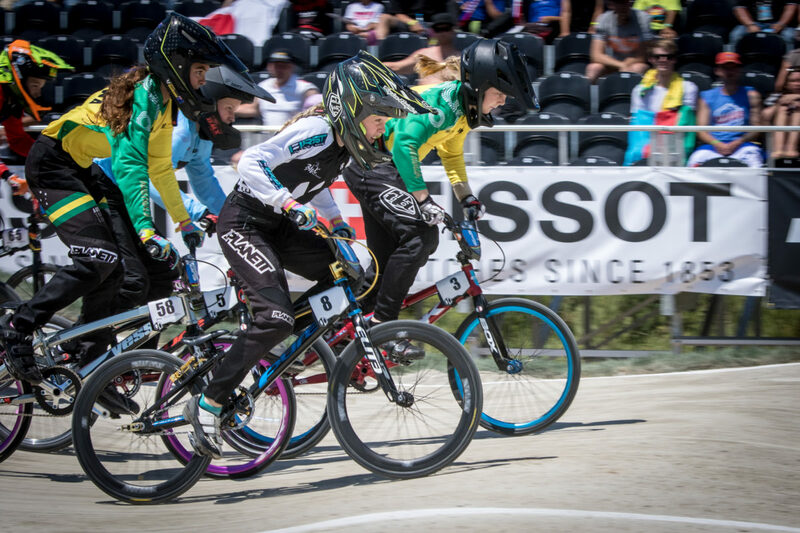 She edged out Hamilton’s Jessie Smith and North Canterbury’s Tahlia Hansen in the final which combined both elite and junior elite riders. While Petch, a former junior champion, won her first elite title, there was also plenty of praise for Smith from the Hamilton club, who took out the junior elite honours in her first year out of the Challenge classes. Her Hamilton clubmate Cailen Calkin won the men’s junior elite final in an unbeaten day after winning all three qualifying motos. Calkin, the 2016 world champion in the 15 years category, jumped well from the gate in the final, to win from Cambridge rider Rico D’Anvers with local Christchurch City rider Liam Goodwin third. Calkin heaped praise on sports psychologist Dave Galbraith as a key contribution to his development. The women’s field was missing Walker with the London Olympic medallist withdrawing to attend a wedding, after the delayed schedule clashed with her travel plans. Petch and Smith, the 2016 and 2017 Challenge World Champion, both won all three qualifying motos with the experience from Petch proving the difference in the final. 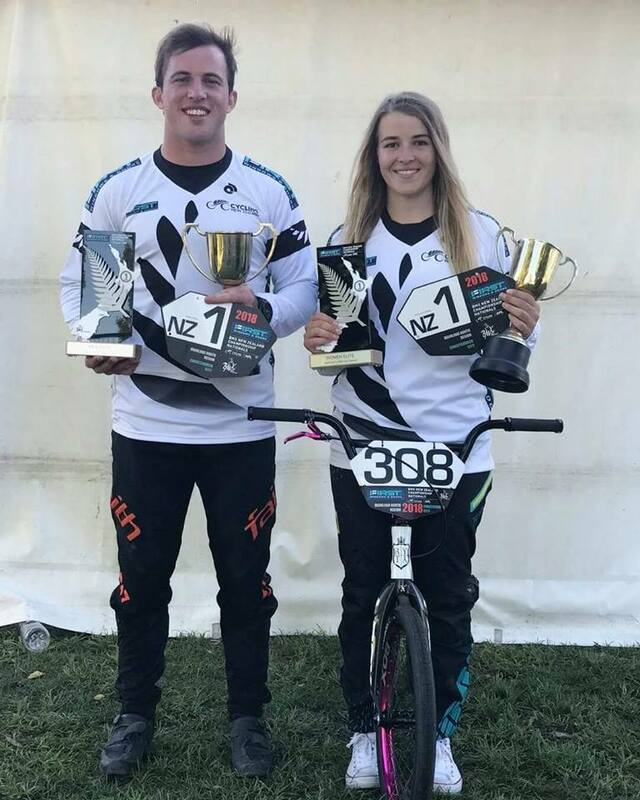 The 2016 national champion Jones, back from his base in USA, and last year’s winner Nick Fox (Gisborne) topped qualifiers in the elite men’s motos, with Hobbs finishing second to Jones in all three qualifying races. Hobbs had an excellent gate to grab the lead in the middle of the track at the first corner, which surprised the Waikato rider. “My mother was standing on the first corner shouting and I realised I was leading and that I better not screw it up,” Hobbs said. Hobbs, who had two years out of the sport on mission in USA, has had two tough years in the sport since returning, injured after a crash in 2016 and not adjusting to the American pro circuit last year. “I have worked so hard to prepare for this year and for these championships. My goal is to ride at the 2020 Tokyo Olympics and hope this result really helps,” said Hobbs who plans a full season on the Supercross World Cup circuit and other racing in Europe. Peel had been relatively quiet with two thirds and a fourth in qualifying for his first elite final, but saved his best for the final with an impressive effort to show that New Zealand has some exciting emerging talent. Tomorrow the elite riders compete in a Superclass competition during the finals day for the South Island Championships. Junior Men, Group 1 Qualifying Motos: Rico D’Anvers (Cambridge) 3 points, 1; Ryan Jordan (Hamilton) 6, 2; Josh Smith (Cromwell) 11, 3. Group 2 Qualifying Motos: Cailen Calkin (Hamilton) 3 points, 1; Logan Hirst (Taupo) 8, 2; Liam Goodwin (Christchurch City) 10, 3. Final: Calkin 1, D’Anvers 2, Goodwin 3, Smith 4, Jordan 5, Cameron Jago (Mountain Raiders) 6, Logan Clarke (Nelson) 7, Hirst 8. Women (elite and junior, Group 1 Qualifying Motos: Rebecca Petch (Te Awamutu) 3 points, 1; Amy Martin (Hawkes Bay) 6, 2; Baylee Luttrell (Hamilton) 10, 3. Group 2 Qualifying Motos: Jessie Smith (Hamilton) 3 points, 1; Zoe Fleming (East City) 6, 2; Courtney Brunton (Hamilton) 9, 3. Final (elite unless noted): Petch 1, Smith (jnr elite) 2, Fleming 3, Luttrell (jnr elite) 4, Hansen 5, Brunton 6, Martin 7, Rayner Jackson (North Avon) 8. Elite Men, Group 1 Qualifying Motos: Trent Jones (Christchurch City) 3 points, 1; Cody Hobbs (Te Awamutu) 8, 2; Cole McOnie (Te Awamutu) 9, 3. Group 2 Qualifying Motos: Nick Fox (Gisborne) 4 points, 1; Michael Bias (North Harbour) 5, 2; Maynard Peel (Sunset Coast) 10, 3. Final: Hobbs 1, Jones 2, Peel 3, Bias 4, Jono Varty (Christchurch City) 5, Fox 6, Daniel Bowers-Wilson (North Avon) 7, McOnie 8.